Just in case you'd forgotten all about it, Studio Wildcard has shared a launch trailer for ARK: Survival Evolved. The game is available on Nintendo Switch worldwide today. Yes, this award-winning dinosaur survival adventure has finally landed on Nintendo's portable machine, letting you tame more than 80 dinosaurs, conquer enemies, and create enormous structures at home or on the go. Developed with Abstraction Games, this handheld version of the game includes all content and features of the original, and you'll be able to team up with 64 other players online or go it alone. If you're unfamiliar with the game, this feature list should help to explain what you'll be getting up to. Suffice to say you'll be stranded on a mysterious prehistoric island, exploring vast biomes as you begin to hunt, harvest, craft tools, grow crops, and build shelters to survive. Oh, and did we mention the dinosaurs? - Free Exploration: Explore the entire ARK Island! - Capture, Tame, Breed, and Ride Beasts: Over 80+ prehistoric and fantasy-inspired creatures and dinosaurs such as the T-Rex, Giganotosaurus, Direwolf, and Yeti. - Harvest, Hunt, and Build: Cut down trees, hunt for meat and scavenge for plants, or start your own garden. Quickly develop these survival skills, as hunger, thirst, basic safety, and protecting yourself from the elements are all part of the game. Build small villages or huge towns using a variety of materials, from wood, stone, metal, or more. Learn new technologies to expand your outposts from primitive huts all the way through futuristic electrically-powered cities. 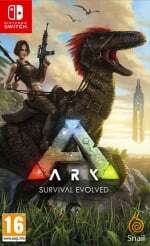 - Customization: The extensive ARK crafting system allows players to mix and match materials scavenged from around the island, while also modifying the colors, textures, shapes and styles. - Intense First or Third Person Action: Engage in visceral melee and ranged combat using a massive variety of weaponry, from slingshots, bows, and spears all the way through modern rifles and pistols, to powerful sci-fi energy weapons and jetpacks! - Mystery of The ARK: Solve the mystery of The ARK as you wander around the massive island, discovering explorers’ notebooks and clues everywhere to piece together the ARK mystery! The game is available today on the Switch eShop for a recommended price of $49.99 / £44.99. Will you be solving the mystery of the ARK on Switch? Let us know in the comments. No time to play it, trying warframe today! That or Valkyria Chronicles. Have you looked at some footage? Eh, I'm saving my money for Smash. I picked it up. It might get interesting, but until then you are dealing with a bad resolution and frame rate. This was after a sizeable update already too. If you're interested, do yourself a favor and wait and see if it gets fixed. Is the game still as buggy and broken as it was in Early Access? I recall the devs decided to "release" it just to double the price and never actually did anything to make the game decently playable. If their ARK Minecraft-clone is better than this, all will be right with the world. @XenoShaun the game still has bugs but in all honesty they fixed a lot of issues. The runs fine on a GTX 960 which is a cheap entry card nowdays (RX 590 and the upcomming GTX 2060 are midrangers). When launched even a GTX 1070 had troubles to run it. This might sound weird, but it would be great if they could slow down with the releases on this console. I find myself swimming in cheesy looking flash games and things that would be better suited for iPhone. Where are all the really heavy hitting games? Weren't they supposed to port the Dark Souls trilogy to this thing? I know Nintendo always got slammed for having not enough games on the Wii U, but that was their own fault because they stopped supporting the system and just let it fizzle out. I'm all for more games, but more GOOD games would be great and LESS of these awful shovelware titles would be even better. That being said, ARK is supposed to be a heavy hitter, but last I heard it was just a really buggy mess. Did they fix the bugs, or pull a Bethesda and port over a buggy game like they did with Skyrim? @Rayquaza2510 That's good to know there is some work going into it. I stopped following soon after it went out of Early Access on PC. @goggles789 Dark Souls Trilogy was just one of many fake rumours. Though apparently a working prototype of 3 was a thing. Would dig 3 if we were to get a release. Switch does get a lot of big games but yeah definitely overshadowed by a lot of mediocre games. I've noticed PS4 suffers similarly too on their psn store, but their store is far better highlighting the bigger games. Though I love the more simplistic and lag free eshop, its still a terrible mess for micromanaging games. Issue is Nvidia here, a easy to port chipset if we are talking about mobile games that are made to run on most "potato" smartphones. And this all combined in a messy, stuttering eshop. I'm so busy with games and life that this would really have to stand out for me to give it a whirl. I can hardly wait for the Digital Foundry analysis on this one! @Rayquaza2510 That's funny, because I tried all those games that you mentioned, including Stardew Valley, Crashlands and Undertale and found them to be incredibly boring and underwhelming. Not trying to dog your favorite thing, just sharing what I thought about them. @goggles789 they are great games but opinions can always differ, myself I hate FIFA, Fortnite and Red Dead Redemption games. Wait for the reviews. If nothing has changed, wait for a sale. @Rayquaza2510 Hey, I hate those games too! lmao And yes, differing opinions can be great. I actually like talking to people who share differing views. It's great for learning. Not everyone cares about Truck simulators and the 20th Indie launch of the month. @goggles789 Tons of shovelware is prevalent on all systems. The Switch just has a barebones shop that doesn't allow you to sift it out. Of the 1300 games available I think it's fair to say that at the very MINIMUM 20% are worth purchasing. I don't think 260 good games is a bad place to be at at this point. I just paid off Smash and Katamari. When I'm not playing one of those over the next few months, I'll be sleeping. This can wait till the spring for me. @Indielink I would say more like 2%-4%. I don't have the patience for mediocre games, anymore. Plus, being realistic, 260 is way too many games for one person to play. Of the 260, maybe 10 will appeal to any one person. I'm still playing. On my PC, 8350 clocked to 4.3 ghz and r9 380 and still getting not a great frame rate (much better than the past) but I just don't see how the switch could handle it. @Rayquaza2510 you follow internet whining people, half of what you state in your comment is not even true. Reviews are worse than bad for this game! On par with Superman 64! This game is a terrible mess and developers never cared to step up to the plate to fix it! @goggles789 I am so with you on that! The sheer amount of shovelware is getting ridiculous and the good games are lost in this sea of shovelware and mobile games rereleasing their titles. I sold my switch back in may and decided to get it back today, but there doesn’t seem to be as much of a change as I thought?! This game wasn’t good to begin with. @goggles789 Cheap looking shovelware is on literally every console. Only difference is it sticks out more on the Switch because Nintendo doesn't try to hide it as much like the PlayStation store for example. @XenoShaun Much worse! They had the guts to release Paid expansions, while the game was still in Early Access on Steam, bugged to hell and run like crap. I saw gameplay footage. Looks like a PS1 game. @Deathwalka I suggest you keep it. I almost sold it, but then I got The Messenger, Rogue Legacy and Dark Souls. Plus, shovel knight gets a physical release in April so at least there’s that to look forward to. I was astonished at how dull Mario Odyssey was, did you play it? @HollowGrapeJ I agree with you there, and that’s the thing. Nintendo should be literally shoving the good stuff to the forefront. We don’t need all these iPhone games cluttering the screen! reminds me of pretty much every popular system. tons of games, most are complete trash. i think the ps2 was the worst offender but that honor may be held by the nes. @goggles789 yeah I’m keeping it this time, I sold it back then as I was a peed off that dark souls was not released when they said and nothing else interested me. But what you said is so true, I wish there were more meaty games instead of the shovelware and mobile games, I’d much rather have old console games as ports. I wish Nintendo were a bit stricter on what they allow through the store. I’ve ordered dark souls and can’t wait to play as I have never played any dark soul games so can’t wait for it to be delivered! @Deathwalka You're in for a treat! Dark Souls, while hard to learn, is a very fun game. Enjoy! @goggles789 Not to hijack your convo, but I totally agree on odyssey. This month was nice for me though: Diablo, Civ, and Warframe are keeping me occupied. @goggles789 Nintendo does a pretty good job with the "Featured" section though. They tend to show off a lot of neat indie games that sometimes I might have overlooked alongside their bigger titles. I remember A Hat in Time coming out on consoles and I was pretty excited and looked for it in the PS Store. It wasn't anywhere to be found which was confusing. I didn't find it until after manually typing it in and I was like "Ah... Okay then." They do a better job hiding the shovelware, sure. Though, it's pretty crazy to think how some indie games can be affected like that by the way they manage things. Now, watch when it comes out on the Switch. I can almost say for sure it'll be featured and getting more attention. I definitely give Nintendo props for helping the smaller guys. I have this game on xbox one. I played the 1 hour time trial longggg ago when it first came out on there early access. I played it solo mode in the dark with headphones on. It was a surreal expierence. Sure the sorta frame skipping animals and pop in n outs and hd n64 like graphics might be along the lines of a bad game these days but for me i got an awsome sense of discovery and jump scares while playing it. Its quite fun on an exploring "land of the lost" type of hype. i enjoyed it. And i recommend it if you can get it for $25 under or on sale. Its pretty cool. It also helps i like prehistoric things. Being able to interact and discover living things only seen in books and movies in their habitat and that enviroment not knowing what to expect is just awsome. There are weather effects too. Its unlike any game ive ever played..except maybe turok. A straight up one way time machine to the prehistoric world survival discovery game. Except no time machine lol. Mario Odyssey was in the top 3 of my least liked games out of the 40 or 50 I've played on Switch. @2legit2quit I'm in Canada and I did not see it either. I preordered it on Switch and played it on my phone while I waited. The screen is just too tiny on my phone. I have the Switch version in hand now but am afraid to open it after seeing initial reviews and video footage. Quality looks trrrible and frame rates are worse. I have an XBox one S and I hear it’s bad there too. I want to play but don’t see that it’s optimized for any console I have. If you get it on cartridge, will you need to download any extra data? @robr I'm glad I wasn't the only one. Was it the constant noise from every movement Mario made? Or the interruptions from on-screen speech bubbles and such? That's what got me. I just went back to Mario 64 and besides the camera, boy has that game aged well! @PhilKenSebben You're good! And that's awesome. How is Warframe? Never gave it a go. Seems very poorly optimized for the Switch. But then again, the game was never particularly good in that department on any system, is what I hear. That trailer's gameplay is very misleading. Been watching a bunch of gameplay and the draw distance and popping looks horrendous. Love the premise, but I think this might be one of those rushed port jobs. I don’t need a reminder of that trash. I love the idea but the execution is just inexcusably bad. Gear.Club Unlimited 2 has my interest instead. Tuesday can’t come soon enough. @Rayquaza2510 ironically I heard that it's the Switch port development that allegedly contributed to a lot of the improvements that have been seen on the PC versions. Basically, trying to make the game run at all on the Switch made them realize just how many areas they had originally cut corners when making the original models on PC with how many of them literally have large amounts of utterly superfluous polygons that were adding nothing in yeens of details due to how they were blended into the geometry and how nobody had cleaned up after the original model. Like, it was a realization that a lot of models were literally more ressources intensive than they should be. But they never realized that until the Switch port because they never had to take weaker hardware into consideration before since in the PC market "throws stronger hardware at it" often take precedence over "try to do a clean and optimized job". I skipped the PS4 version because the game ran like s#*t. If it runs much smoother on Switch I might consider buying. @goggles789 Its a fun third person shooter, a dash of Destiny-like rpg progression with a hefty grind, but its free. Also packed with content. I do want this game on Switch. Very much so. Unfortunately I’ve seen some footage that shows it has some fairly significant frame rate issues and poor handheld optimization. I do understand there was a day one update which probably addressed some of these problems, though I doubt it completely eliminated them. I’ll hold off until reviews come in, which I’m not expecting to go over well, and provided that is the case I’ll be waiting to see if they fix the game up. They can at least get it in a respectable state I’m in. I got mine yesterday it runs fine, a little bit of drop frame rate in handheld mod when there is a lot on the screen but that to be expected however in TV mod it's better that when I played it on PS4. @JaxonH it's weird, the game looks bad and runs bad, especially in handheld mode, but it doesn't play bad. Then again, I enjoy survival games once in a while and this is interesting to me. Honestly, they're probably tanking the framerate by trying too hard to have detailed reflections in the water. They would get better performance if they scaled that back significantly. A sh*t game + a sh*t port = a pile of sh*t. Similar to Rollercoaster Tycoon Adventure... why do they even bother making these type low quality game? The people who buy them are to be blamed for supporting these type of crapware, then again they were punished with a crap game. I could write paragraphs on it, but I don't want to derail too much. I seemed like the focus was on the "experience" and not actual gameplay. I felt when I died it wasn't my fault, and despite that, I lazily breezed through the main game (after I figured out how to cheat the horrible lion thing). There's all of these mini-games and and gameplay changeups and transformations and whatnot, but the core mechanics of landing on an enemy's head or hitting them with the hat or basic platforming was not remotely on par with the NES/SNES iterations. While not necessarily "broken", the challenge in the game was fighting the controls (when Mario is Mario) and the camera. Some things just don't translate to 3D well, and the hat throwing is supposed to fix that, but... I couldn't aim to save my life. Plus, the storyline was cringeworthy with it's implications, while also a complete step backwards at face value. Everything involving Peach really bugged me (and I'm a dude). (I did not care about nor for Mario 64 when it came out, either). However, except for some clunky boss battles, I thought Zelda BOTW controlled and played perfectly. It was 3D done right. Heck, I even liked the new Doom (well, except for the platforming).